The Walking Dead is about to hit the small screen again. I was a late bloomer to the show and after a four day marathon I have come up with my list of top ten episodes from the last four seasons (minus one!) . I hope you enjoy the list and agree and disagree vehemently! The Walking Dead lives and breathes off of its reset button. It loves to put our heroes in an environment only to slowly strip down the walls of that safe have, piece by piece, as the season unfolds. Beside the Dying Fire works beautifully on that level. After a season of farming and dealing with internal conflict we are reintroduced to the zombies – and a lot of them, as they attack Hershel´s farm in grand style. Couple that with Rick finally taking his role as leader seriously, a role he is frustratingly reluctant to take, and it made for a season ender full of all the action and drama a viewer needs to drive them crazy during the summer months without their favourite new show. Fortunately, I just clicked on “Next Episode”. Yet another season finale makes my list. This is a more subdued season ender compared to others, but it does an excellent job presenting the stakes of the show. After having their camp overtaken, the group is off to get answers from the CDC. I thought, “Great, so now we have a run after a cure show!” but instead we are given the opposite – the CDC is on auto destruct, there is no cure, and even worse things could be in the air! We are now in desperation zone right along with the characters. The episode also goes on to deal with suicide. It´s a tough issue which thankfully isn´t brushed away, but brought up again in a very serious manner throughout season two. This was one of my favourite morality themed episodes from The Walking Dead. Glenn, who at this point in the series was still a pretty cool character, is holding on to some big secrets the best he can. Of course everything gets discovered, but that was expected. What I didn´t expect was an abortion debate between husband and wife, Lori and Rick. The decision to bring a child into this world is not always an easy one, imagine it in a world that has completely gone to hell. Moments of honesty about issues of today set in a backdrop of a possible tomorrow are what make sci-fi so dear to me. Here, The Walking Dead took that mantle and raised the bar for the show. This may not be the most action-filled episode but it certainly won my respect for what it said. This was the episode I had been waiting for, a head to head confrontation between Rick and Shane. Throughout the series Rick has a tendency to let his goodness get the best of him, nowhere was it most evident than in his turbulent relationship with his best buddy Shane. Here they have a chance to talk it out and Rick let´s Shane know exactly where he stands: that he may be a nice guy but he´s no pushover. This is all done in the midst of a storyline about leaving a kid, who was not part of the original group, out in the middle of nowhere so as to protect the group. This is the alternative to just putting a bullet in the kid´s head. The moral lines couldn´t be more blurred and the tension more hot. When Shane gets trapped inside a school bus surrounded by zombies and Rick could very easily leave him for dead, we get a taste of what either post-apocalyptic trouble shooting, or human mercy, might look like: neither is easy, but we have to live with the consequences of both. 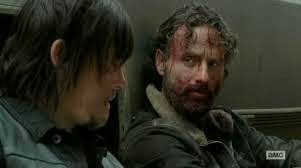 In this emotionally explosive episode the group must decide on the fate of a young man that was separated from his own violent group and brought back to camp by Rick. The two choices are either to let him live among the group (and given a chance to prove his worth) or kill him (based solely on his guilt by association). Everyone is mostly on board with the plans to kill the boy except for Dale, the voice of moral reasoning. This episode showcases Dale´s capacity to demonstrate compassion, assertion, and despair, seamlessly, as he makes a case to save the boy´s life. This becomes one of the great “What would you do?” episodes that work beyond the context of a zombie apocalypse show. It´s only misstep is allowing enough time for Carl to make another boneheaded decision. At this point in the series I was wondering why they hadn´t left him locked up in the barn already. The defeat in Dale´s eyes after making a losing case was more than enough to make up for that little error. I know that for those that had had to wait week after week for the endless search for Sophia, this season two story line must have felt overly long. As a late comer to the show, and having the benefit of doing a back to back marathon, I thought this was a satisfying ending to the saga, that came at just the right time, shaking up everyone´s moral compass with it. By now, I had already become accustomed to the not so happy endings, but this was the one that asked me to go even deeper into hell. It raises an important question for our heroes (and anti-heroes): what is left when one removes hope from the equation? Is it possible to navigate the darkness when the it is both outside and in? The show turned a corner into some murkier territory here, and though it may have faltered a bit the following season, it thankfully never looked back. One thing that attracted me to The Walking Dead is its similarities to another of my favourite shows, LOST. One of the devices that they both use a lot is putting the ensemble cast together only to find devious ways to splinter them up and then join them again. A, is a culmination of a half season of regathering after the tragic end of the prison. To this point everyone had been making their way to the mysterious Terminus, and soon Rick, Carl and Michonne would arrive there too, but only after a chance encounter with Daryl and the gang of lowlifes that he had grouped himself with in order to stay alive. The encounter at the edge of the road stands as one of the most gripping scenes I´ve seen in the series, proving that the series can usually “outchill” itself in small set pieces rather than with a barrage of zombies from the boondocks. Rick, who is in a constant struggle with self leaves no doubt in anyone´s mind that he would do anything to ensure his son´s safety – even going full out zombie attack on someone. This me leaves me to wonder how his character would react if Carl was no longer in the picture, not that I´m wishing it or anything! This is an early episode which introduces the concept of humans being more of a burden than the zombies. Glenn is kidnapped by what appears to be a Latino gang while on a mission to get Rick´s bag of guns, the same had left back, in downtown Atlanta. Rick and company are able to capture someone from the group that took Glenn too and so the stand off begins. The episode surrounds their struggle to get Glenn back, while keeping their guns and their lives. Just as it seems like everything is going to the birds we are met with a pleasant surprise which teaches us to never judge anything by its appearance. This episode stood out for me in that it demonstrated how well this series can play on human to human conflict, especially when it comes to breaking stereotypes. The Walking Dead works best for me when it portrays a human reconception of the same world and values that they had stood for before the world went to the zombies. Though the zombies´ presence gives the series it´s pulse, episodes such as this, where they are but a backdrop, give the show its heart. Here I go with my LOST comparison again, unfortunately not a good one. Season three of The Walking Dead felt a lot like The Survivors vs The Others, only with predictable plots and worse acting. 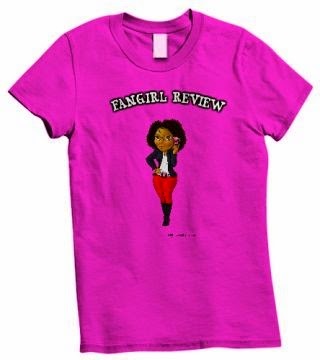 This is why no episodes from that that season made my top ten, maybe top twenty! I was glad when, in this season 4 mid-season finale, The Governor finally did what had been wanting to do for some time: kill off some of our heroes and take over the prison. Much like in the end of season 2, the producers went all out with the action and the zombies. Though it´s true, the show is carried by the tribulations (often internal) of the main cast, it´s good to be reminded that this is a zombie show and the that zombies are ruthless and dangerous. 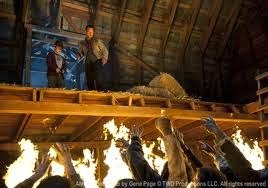 Yet, the the real greatness of this episode was in it´s portrayal of The Governor as twice as ruthless. His shift from psychotic to absolutely deranged was the stuff of great villains. With nothing to live for, he found plenty that people should die for. Too bad that it was too little too late for his character. This episode almost made me cry! The last thing that did that to me was Toy Story 3, so it´s a rarity! Carol has been one of my favourite characters on The Walking Dead because she has quietly gone from quiet victim to quite warrior. Earlier in season 4 one of her decisions at the prison got her cast out by Rick, but as fate would have it she was reunited with four of the survivors of the prison debacle, two young sisters Lizzie and Mika, Rick´s baby daughter Judith, and the man whom her actions at the prison directly affected, Tyreese (though he doesn´t know she was the culprit). The magic of this episode is in how it tricked me into believing that its inevitable end would be a confrontation between Carol and Tyreese. What brought me to am emotional halt was where the writers took the story of the two young girls. Good drama can touch on heavy subjects with skill and tact, but how does one deal with a young child´s psychosis is a lawless world? It must not be an easy task for any writer, yet they delivered with absolute mastery. 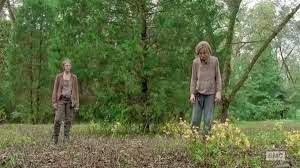 At episode´s end Tyreese and Carol do sit down to have a little talk, but after what Carol goes (and has been) through it´s understandable when they allow for bygones to be bygones. This is the tight character episode I hope to see more off when the series restarts.